repeat until the last whistle blows - your $750 donation is equivalent to $8 per game and as much as 10 minutes of screen time! Do you have a special offer you'd like to make to the Saxon community? have a brief announcement made over the PA system. *Logos should be provided in JPG format. 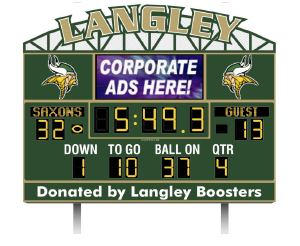 Advertising through the Langley Athletic Boosters is a great way to promote your business to Great Falls and McLean families as well as families visiting from other schools and youth leagues. Last year Langley hosted over 100 games and community events with crowds as large as 3,000! The Boosters recognize the need to target your audience and we're ready to work with you to find an option that fits your budget and meets your business objectives.